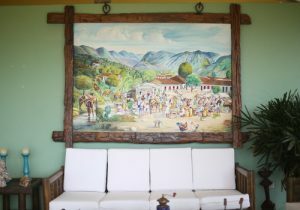 Visiting a coffee farm in Antioquia is an authentic, cultural experience not to missed. Just 1.5 hours from Medellin, your day on one of Colombia’s oldest coffee farms is interactive and hands-on. Go on walks in the gorgeous mountain valley, plant a coffee tree, arrange to go horseback riding, or relax by the swimming pool. This trip is a relaxing break with a required fitness level at 1 out of 5. You don’t have to worry about doing anything physically demanding. After breakfast, your driver meets you at 8 AM in Medellin and drives 1 ½ hours to the small mountain town of Fredonia. (Option for both private transport or public bus). Here, meet your local bilingual guide and drive ten minutes in a 4X4 Jeep to Sierra Finca. Climb to 1800 meters and take in a breathtaking view of the impressive Cerro Bravo peak. Relax by the swimming pool and enjoy a traditional Colombian lunch. Meet a coffee grower and plant your own coffee tree. Learn about the coffee making process from them while sipping on the soft and balanced coffee of the finca to discover notes of cherry and citrus. Take a break with a refreshing beverage and a dip in the pool and enjoy a traditional Colombian lunch at the estate house. Drive 1 ½ hours from the farm to return to Medellin by 7 pm. * arrival time varies. Extend your trip by 1 day and 1 night to stay overnight in gorgeous, luxurious rooms overlooking the coffee finca estate. Enjoy the peace and calm of the sunset from your balcony with all meals prepared by the estate’s chef and staff. Arrange to go horseback riding the next day,. 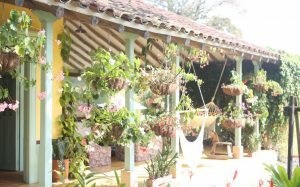 Or take a five hour trek to the summit of Cerro Bravo Peak, or visit the town of Fredonia and the coffee farm’s music foundation at the local school. Please contact us for optional add-ons or public transportation.